Home Biafra featured Biafra: Can Election Boycott Ends Buhari’s Brutal Regime? It is not ideal to venture in electioneering that cannot be counted, electorates are only remembered every four-year interval to exercise their civic responsibility after which state-sponsored terror, brutality comes forth as a payback than the dividend of democracy. This became worst when Buhari was rigged into power by external factors David Cameron Former British Prime Minister and his counterpart Barrack Obama then US president. Since the 1999 unproductive snail unofficial uninterrupted democracy in Nigeria, she never had credible free and fair election without manipulation, mostly rigging are perfected by foreign actors responsible in holding Nigeria ransom, electorates popular demand become inconsequential. Before election campaign selection had already been taken place by the British, with strict conditions in favor of creator of Nigeria melted on the nominee to accept making votes worst than useless you can think of. Many Nigerians are curious to ascertain why their leaders malfunctioned on their assign constitutional responsibilities, it is simple they all puppets to external factors that snuffed them into political power inferiorly worked less than ceremonial leaders being controlled externally. 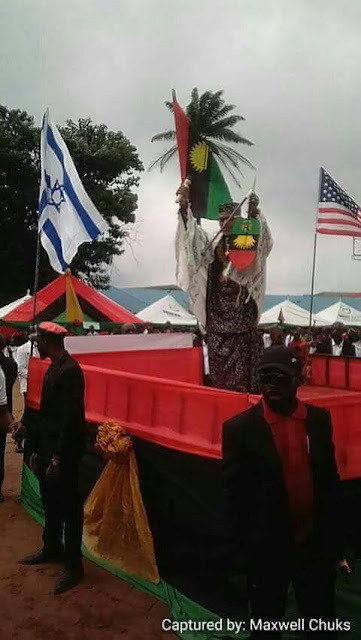 IPOB sets agenda for Nigeria to follow, it was initially made known by Nnamdi Kanu, elections in that slave camp called Nigeria are not beneficiary for common men. A total boycott was spearheaded by him when Nigerians were snoring in deep sleep today political parties are on the fence contemplating to boycott forthcoming 2019 election. Therefore, personally either boycott or not it won’t make any difference, a case study of Anambra State governorship election boycott shall replicate itself in a sense that Nigeria dubious politicians must disagree and agree in consensus and install the favorable candidates of their choice to continue terror than allow the hopeless entity disintegrate. People predicted Buhari might be the last president, forgetting he can easily sign a gay marriage and fund United Nations with all the oil money accrue in Biafraland to retain his position. Game of politics is a game for smarts; Hausa Fulani politicians are hell bent to outsmart anybody not minding the implication at the long run. Should election boycotted world can only acknowledge the disenfranchisement but either Buhari or his associates will still capture the power in continuation of oppressive regime perhaps, making only election boycott meaningless without uprise force attachment. Mere total abstinence might not really border Nigeria government hence; they can inflect election results we ought to learn from broad daylight rigging in Ekiti State governorship election. Total overhauling through popular revolution only remedy to put an end of totalitarianism tormenting indigenous population, inference in Arab Spring is a thing of emulation, Biafrans had seen it all they neither be caw nor deterred Hausa Fulani can only shoot once referendum is conducted before their fraudulent already rigged election commences, Nigeria will be in a history of dustbin. At this critical situation, timing is important, failure to observe it is synonym allowing enemies urinating on the grave of our falling heroes that fought for our survival seeing Nigeria election before Biafra referendum. Their nonsense defection from one party to another was to distract attention from making gullible fellows believe their new strategy to make a change in the next tenure. Lets no one be deceived, recycling of rubber stamp politicians is the equivalent thing as drinking the same contaminated dirty water over and over that deteriorate health condition. Obasanjo, fought tooth and nail to opt out formal president Goodluck Jonathan from office through a coalition of different political parties that ushered in a brutal regime, today they are repeating the same political strategy. What is the criteria present game shall make a difference in the future? Or do Nigerians so daft to learn from their past mistakes? A word is enough for the wise; Nigeria is a fail conglomeration without political remedy radical transformation a panacea to change the status quo be it in peace or war for absolute overhauling of all component units to go their separate ways seems unity in diversity is not workable.